The data center is a dedicated space were your firm houses its most important information and relies on it being safe and accessible. Best practices ensure that you are doing everything possible to keep it that way. Best practices mean different things to different people and organizations. This series of articles will focus on the major best practices applicable across all types of data centers, including enterprise, colocation, and internet facilities. We will review codes, design standards, and operational standards. We will discuss best practices with respect to facility conceptual design, space planning, building construction, and physical security, as well as mechanical, electrical, plumbing, and fire protection. Facility operations, maintenance, and procedures will be the final topics for the series. Codes must be followed when designing, building, and operating your data center, but “code” is the minimum performance requirement to ensure life safety and energy efficiency in most cases. A data center is going to probably be the most expensive facility your company ever builds or operates. Should it have the minimum required by code? It is clear from past history that code minimum is not the best practice. Code minimum fire suppression would involve having wet pipe sprinklers in your data center. That is definitely not best practice. This standard develops a performance-based methodology for the data center during the design, construction, and commissioning phases to determine the resiliency of the facility with respect to four Tiers or levels of redundancy/reliability. 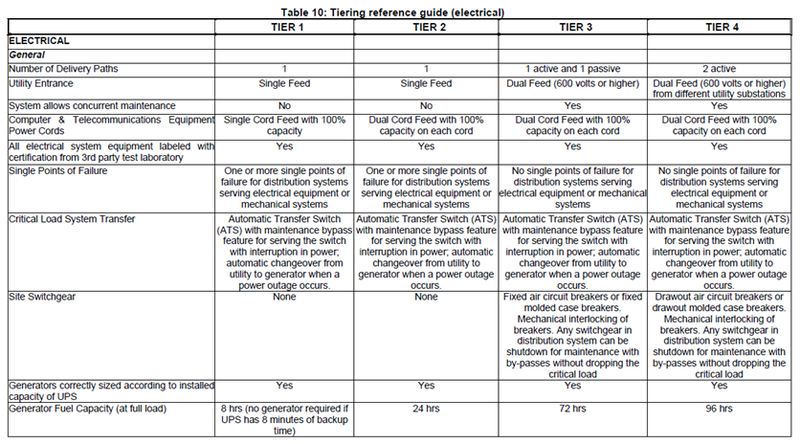 The Tiers are compared in the table below and can be found in greater definition in UI’s white paper TUI3026E. The origins of the Uptime Institute as a data center users group established it as the first group to measure and compare a data center’s reliability. It is a for-profit entity that will certify a facility to its standard, for which the standard is often criticized. Data Center Design and Implementation Best Practices: This standard covers the major aspects of planning, design, construction, and commissioning of the MEP building trades, as well as fire protection, IT, and maintenance. 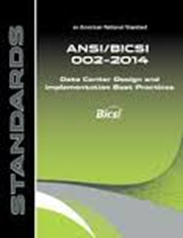 It is arranged as a guide for data center design, construction, and operation. Ratings/Reliability is defined by Class 0 to 4 and certified by BICSI-trained and certified professionals. TIA has a certification system in place with dedicated vendors that can be retained to provide facility certification. Government regulations for data centers will depend on the nature of the business and can include HIPPA (Health Insurance Portability and Accountability Act), SOX (Sarbanes Oxley) 2002, SAS 70 Type I or II, GLBA (Gramm-Leach Bliley Act), as well as new regulations that may be implemented depending on the nature of your business and the present security situation. These standards will also vary based on the nature of the business and include guidelines associated with detailed operations and maintenance procedures for all of the equipment in the data center. The nature of your business will determine which standards are appropriate for your facility. If you have multiple facilities across the US, then the US standards may apply. For those with international facilities or a mix of both, an international standard may be more appropriate. The key is to choose a standard and follow it. If deviations are necessary because of site limitations, financial limitations, or availability limitations, they should be documented and accepted by all stakeholders of the facility. Regardless of the standard followed, documentation and record keeping of your operation and maintenance activities is one of the most important parts of the process. Software management tools such as DCIM (Data Center Infrastructure Management), CMMS (Computerized Maintenance Management System), EPMS (Electrical Power Monitoring System), and DMS (Document Management System) for operations and maintenance can provide a “single pane of glass” to view all required procedures, infrastructure assets, maintenance activities, and operational issues. Your facility must meet the business mission. Data center design, construction, and operational standards should be chosen based on definition of that mission. Not all facilities supporting your specific industry will meet your defined mission, so your facility may not look or operate like another, even in the same industry. About the author: Steven Shapiro has been in the mission critical industry since 1988 and has a diverse background in the study, reporting, design, commissioning, development and management of reliable electrical distribution, emergency power, lighting, and fire protection systems for high tech environments. His experience also includes providing analysis of critical application support facilities. Mr. Shapiro has extensive experience in the design and management of corporate and mission critical facilities projects with over 4 million square feet of raised floor experience, over 175 MW of UPS experience and over 350 MW of generator experience. Mr. Shapiro is the author of numerous technical articles and is also a speaker at many technical industry seminars.